Leila Baker from IVAR shares her thoughts on the first 'pause and reflect report' to emerge from the Empowered Communities in the 2020s research. Over the last few weeks I have been thinking about where we should take this research next. I have read and listened to the findings of other inquiries as they try not to lose the thread between crisp analyses of global trends and messy, slippery, unique experiences of so-called ordinary people. And I have thought a lot about the relationship between small acts of kindness, of taking the time to talk to someone you might not normally have talked with and finding a way through what one research participant called 'these troubled times'. Today we share with you the latest findings of the Empowered Communities in the 2020s research. And it is something of a relief that we have jettisoned the term 'empowerment' altogether and now talk about power, power relations, politics and democracy. I suspect as we move into the next phase of this research we will add 'justice' to our lexicon. 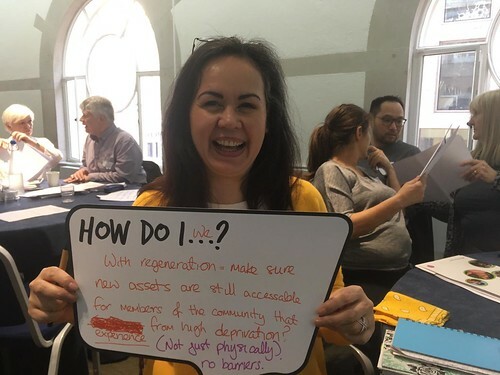 An early finding for our research has been disquiet across the UK about a significant lapse in spaces and opportunities for community learning and debate. Of course there are wonderful examples where this kind of learning is being sustained. But the point made by our research participants is that where such spaces and opportunities exist, many have become codified, closed, managed into programmes and initiatives whose purpose is prescribed. And that these programmes leave little or no room for the kind of spontaneous encounters, conflict or expression of dissenting or even unpalatable views that eventually lead to real shifts in power, relationships and politics. They do not challenge us to engage with people whose views are different from our own. The erosion of our public spaces hasn’t helped, nor the disappearance of the informal networks created by local civic buildings like post offices and libraries as well as small businesses and pubs where people can encounter one another in small, unplanned ways. In this latest report we summarise participants' views. They've told us that there's a need to create open spaces where tough conversations can take place, where critical thinking and reflection is encouraged and where people can express and be challenged about their own views on difficult topics like immigration, like competition for scarce work, housing. This has to include space for people to express views that may be unpopular and unpalatable. Only such bottom up approaches to dialogue in communities that are not driven by government or programme requirements can lead to the redistribution of power. We have been overwhelmed by the level of interest and scrutiny in this research. There are ways that people can engage with the research independently and we would encourage anyone to look at those - they last from 5 mins to a whole day. You can read the full report here and share your reaction with us on Twitter using #Empowered2020s or through the latest survey.